So after 29 hours and 279 miles, I'm finally home after a superb paddle on the Wey, which is just 80 miles away!?! The reason for the rather circuitous journey, was a purchase last weekend, which needed collecting - namely a new whitewater paddle, a Werner Natahala at a bargain price of just £80, with not a chip or scratch in sight! So having got up at 05:00 on Friday, for a morning shift at work, I finish at 13:00 and headed toward Bristol to collect the paddle - fortuitously I have relations in Bristol, who were able to pick up and pay for the paddle from the vendor, so I could just swing by for a coffee and the collection. By 15:50, I was refuelled with coffee and equipped with my paddle, the journey to Send was the next leg of the trip, where I was to spend the night. At 18:00, I arrived at the Send Business Centre - the car park was empty and the workers had all gone home, so I parked up at the far end by the trees to afford me some privacy. 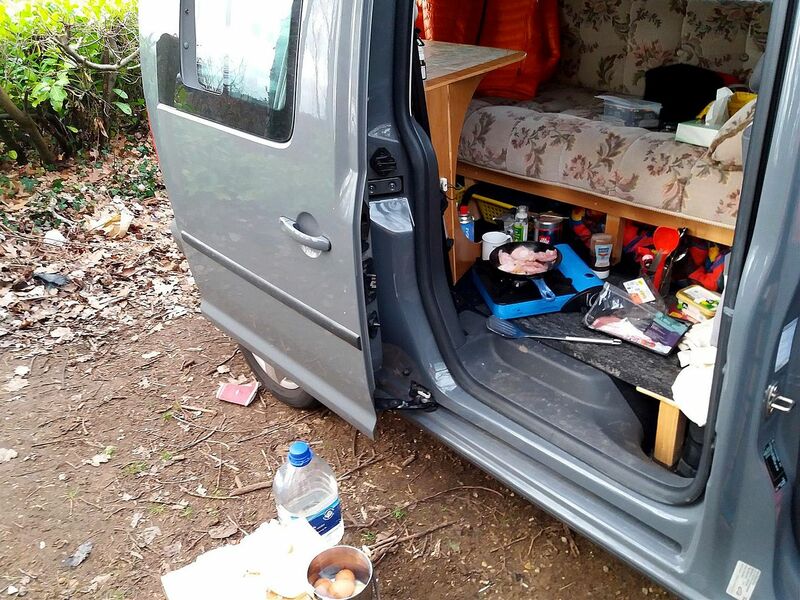 With a quick rearrangement of the contents of the Paddle Wagon, the front seats were fully loaded with the canoeing kit and the back was set up as my cosy home for the evening. Shortly after Maj arrived to say 'hello' and we wandered off across the common to spot some potential camping spots for future trips - this proved to be rather muddy and futile, as the lack of natural lighting and lengthened shadows caused by the torchlight, made it tricky to identify suitable spots. After a mile or so of wandering, we made it back to the Business Park and Majid kindly shot off to grab a couple of portions of chips, as I wasn't feeling in the mood for cooking. The chips went down very well and soon, I was starting to fade - it had been a long day. Maj said farewell and I pulled the curtains closed. It turns out that the Business Park is quite the social gathering place after dark, for the local youffs to gather in their Corsas and Fiestas - to be fair, whilst I could hear the thumping bass line of their music and their hacking coughs from smoking too much weed, their noise was relatively non-intrusive and by 22:00 I was sound asleep. I woke a couple of times through the night, firstly as I was too hot and secondly due to being bathed in the floodlights of the adjacent car park - I was amazed that they leave these floodlights on all night. By 07:30, daylight and bird song had started, so I started a gentle wake up programme, lazily getting up at around 08:00 - giving me plenty of time to brew some fresh espresso and make some bacon sarnies. The boiled eggs were for lunch! By 10:00 cars loaded with canoes started to arrive and after all the introductions and boat loading, we were ready to launch at 11:00. The plan was to complete the Gresham and Abbey loops and we had a welcoming committee at the put-in too. We headed 'upstream' towards our first turning point at Worsfold Gates - the funneled wind that we had experienced at The Tannery slowly faded. After turning the corner and heading down the River, we soon arrived at 'The portage' and Maj decided to perform a special dance before disembarking. This portage (just under 1/2 mile) is across a tussocked field, which makes it challenging when using a trolley - there is a smoother path to be found, but this makes the portage a little longer. Some choose to just carry their boats, others take the smoother path option, but I was equipped a trolley that I had designed and built to defeat this field! I am pleased to report it worked, my super sized wheels (20") and laminated beech suspension frame bounced across the field in a direct line, fully loaded - it possibly didn't save me a lot of time, but it proved the design worked - just need to adjust the amount of lateral axle movement. Within 10 minutes, we were all downstream of the old mill and began lowering our boats into the millstream. All launched, we had a little play and peer around the arches of the mill and realised an underground exploration may be possible through the left arch... hmm, one for another day! We then headed downstream, with a nice amount of flow, past Samson's favourite haunt - we did find a swan, which I herded for the next 1/2 mile or so, but he was far too benign to be Samson. After lunch, much discussion took place as how best to launch to avoid getting wet feet. The river continued to flow towards the east and we enjoyed the assistance. A father and son were fishing on the opposite bank and had a large pike on the line - unfortunately it snapped the line and escaped just seconds from being netted. The excitement on the boy's face was palpable. The new helicopter method of propulsion. The Abbey loop is relatively small, and before long the dramatic ruins appeared before us - it's hard to believe that this abbey isn't owned and protected by The National Trust or English Heritage. The clouds remained ominously poised as we headed toward Newark Lock. We put back in at the new 'floating' landing stage (an interesting design which clearly failed to find it's way past any Health and Safety committee) and steeled ourselves for the head to wind onslaught up to Papercourt Lock, the final portage. Above Papercourt Lock and in the shelter of the trees, the canal took on a surreal stillness, just before a small shower passed over us. Soon we were back at The Tannery and once again were greeted by the local resident swan. The whole trip had been a pleasure to paddle and we arrived back at The Tannery perfectly to schedule, which allowed me to pack up and get home for 18:15. Many thanks to Jim for organising and to Maj, Nick, Graham, John and Ann for their superb company and assistance with the portages - a fab day out! That new platform is a strange one! First came across it last Sunday evening. It was a damn sight easier to get in without scratching your boat before, but I appreciate the effort. The new hard edged pilings downstream aren't exactly canoe-friendly either! Ann and I have a lovely day, thanks for all the help with portages etc. Somehow I missed this excellent blog yesterday. Great photos and write up of a very enjoyable day. On behalf of Surrey, I apologise for the yoof intrusion into your evening. I imagine that very few car parks are hatchback free after dark these days. Still, worse things go on in some of them, or so I understand! Hope to see you on the water again soon and thanks for making the long trip. I love seeing these sort of get together trips. Nice people here. Anyone passing the lunch stop would know it was SOTP ... just from the number of stoves used for relatively few people.